Local boy Jon Lester faces the M’s ace in the best match-up the series tonight. Felix has been Felixing now for quite some time, staving off velocity loss, the occasional injury scare and wear-and-tear-related decline to post four consecutive excellent seasons, with a fifth half completed. These five years, 2009-2013, come after several more where he was merely ‘very good,’ of course. Jon Lester’s tenure as one of the best pitchers in the American League also began in 2013, but it’s well and truly over now, after a large step backwards in 2012 and stagnation in 2013. His fastball, which averaged 95mph in 2009, is now in the 93mph range, and the cutter he’s used as his outpitch is less effective than ever. Lester also uses a change and curve, and while the curve wasn’t bad early in his career, it’s clearly been his third- or fourth-pitch since 2009 or so. None of this makes Lester a terrible pitcher. He’s still capable of getting strikeouts and grounders, and wasn’t as bad as his ERA made him look in 2012. Unlike many pitchers, Lester’s peak lasted more than a season or two, and he’s still adding value in the years following it. But barring a miraculous turnaround, it’s starting to look like Lester’s finished as an elite starter. It’s the sort of thing that makes you reflect once more about how strange and wonderful it is when a pitcher’s able to sustain greatness for a long period of time. Regression, age, attrition and even advanced scouting all pull pitchers back towards their less transcendent peers, and mostly succeed. A handful refuse, and through a combination of adaptation and talent, continue their run. Dustin Ackley gets the day off against a tough lefty…so that Mike Saunders can face him. Hmmm. The M’s double play combination looks great, but of course it was about a month ago that M’s fans still held out hope that Dustin Ackley would reclaim his spot at 2nd and spend a decade getting on base and playing surprisingly good defense. In “it’s not just the Mariners” news, the Athletics DFA’d Adam Rosales and called up Grant Green, the ex-SS/ex-CF who moved to 2B and is hitting well in his second tour of the PCL. There are a lot of story lines in this – from Green finally finding a defensive home to the A’s middle infield depth (remember Hiroyuki Nakajima anyone?) 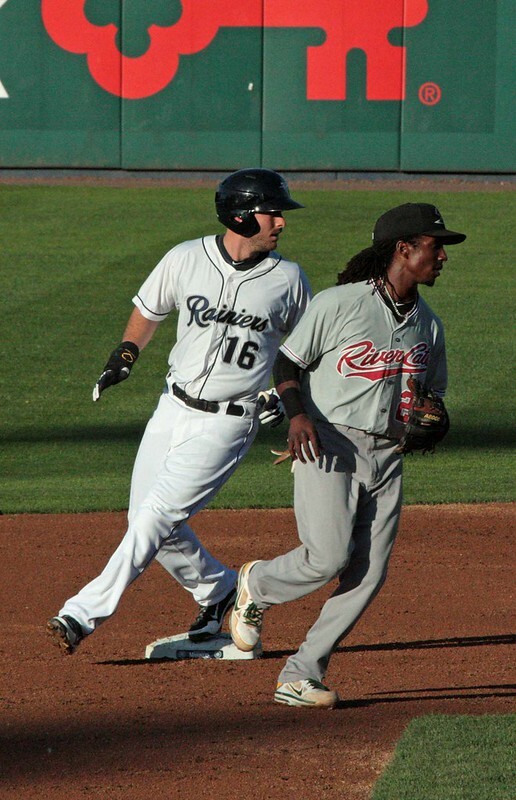 shriveling – but the one I want to highlight is that the A’s finally gave up on their one-time 2B of the future, Jemile Weeks. Weeks debuted in 2011, just like Ackley. In his half-season, he posted a 110 wRC+ and if his walk rate and power were minimal, he looked to have well above-average contact skills. Weeks regressed so badly in 2012 that he was sent to the minors, and began 2013 there. A few weeks ago, both Weeks and Ackley were PCL 2Bs, trying to recapture their hitting stroke, and then watched as other prospects moved past them. And so, just like Ackley, Weeks is now attempting to learn center field. Tyler Pike, Luiz Gohara and James Paxton highlight a prospect-rich day in the M’s minor leagues. Isn’t Baby Steps Monty playing in Arizona? Montero was 1-1 in his first rehab appearance in Arizona yesterday. There were a lot of Sox fans from the cheers when they were scoring earlier. I didn’t see Carp’s other at-bats. HAH at the “I’m a big Red Sawks boy now” beard! This was probably the best game I’ve watched all year. Felix on the mound (hopefully getting a W), the young players hitting the crap out of the ball, Raul going yard again, and to top it off – it was against the Red Sox and all their bandwagon pink hat fans who come out of the woodwork to infest Safeco. Hey, Ollie, how bout you get outta this, rather than tank your trade value? Excellent game to watch tonight, but, of course, I can not resist. Does anyone else wonder why Perez, our set-up man, closer, best reliever right now, was brought into the game with an eight run lead. I know we don’t want to “get greedy at this time of year” and win or even sweet a series, but…. Thanks Sowulo. I figured he had to be getting pretty close to playing by now. This is week #6 or #7 post injury/surgery. 6 for 18 in a single game is no big deal, Dave. What is good is having 18 (now 19) AB with RISP at all. I thought the same thing, Bread. These sports nicknames are out of control. Been mentioned already but I am so encouraged by the quality of at-bats tonight, like that long out Nick Franklin hit. We are now seeing a critical mass of guys who know how to HIT. So many encouraging at-bats tonight! Going to enjoy this. This calls for a celebratory drink. Dustin Ackley needs a nickname. I propose we call him “Two Sheds”. I like that! Bill the Cat! My wife and I both got it without needing the jpeg, pgreyy. Make it so! I don’t see why fans need to find scapegoats to blame especially among the younger players. There is no reason to rip Ackley for not performing up to everyone’s expectations. He has shown as much effort and work ethic as anybody could expect, and its pretty petty to rip him for not matching his performance with his expectations. Its one thing to rip a player like Josh Hamilton or Milton Bradley, players getting paid 10’s of millions, but baseball is hard and not everybody can meet the challenge. Ackley doesn’t deserve a job if he can’t perform, and frankly I don’t think he plays the outfield any better than Ibanez does, he looks just brutal out there. And of course there is no way he is getting his 2nd base job back. But that is the way baseball works, but there is no point in coming up with denigrating nicknames or trying to belittle him because his efforts have fallen short. Kazinski, The point was most baseball players have some sort of nickname and Dustin Ackley doesn’t have one. “Two Sheds” was a Monty Python reference – and the guy (Arthur “Two Sheds” Jackson) was as normal a guy as you’d ever find on that show (it was the crazy people around him that was the funny part of that skit – they inexplicably gave him the nickname “Two Sheds” because he had, at one point, considered buying a second garden shed). And while I can’t speak for pgreyy, it seems pretty obvious the “Bill the Cat” nickname was simply because Bill’s trademark sound was “Aack!” – as in “Aackley”. I don’t see either of those as denigrating in the least. “Two Sheds” was just random, and if “Bill the Cat” is disparaging then so is Rauuul.